Performance is also in-line with expectations. The model we have features a 128GB SF-2281 (SandForce) based SSD and a faster CPU than the base 11-inch MacBook Air model giving it the edge in PCMark 7. Although the system is configured to sleep rather than shut down by default, a full boot from scratch (not hibernate/STR) takes only 16.7 seconds. That's actually in-line with how long an 11-inch MBA takes to get into OS X (17.2s). Very impressive indeed. 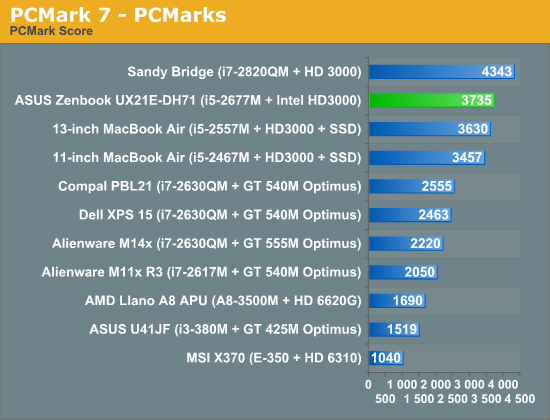 The machine feels extremely well built and is quite snappy thanks to its Sandy Bridge + SSD combo. More details soon! Does 1600x900 count? 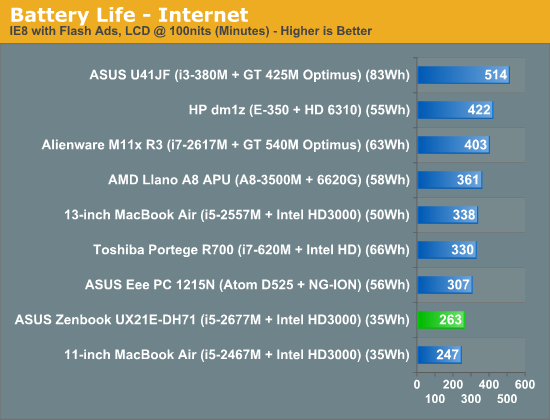 Someone, IIRC ASUS is selling 13" models with that resolution. Is the screen with a black bezel? "The fact that there aren't any surprises is a very good thing as it means ASUS' default configuration doesn't include a bunch of battery-taxing bloatware."